Power plant value is increasingly being driven by the flexibility to ramp up & down. The relationship between variable dispatch costs & market prices is key. Peaking flex: higher variable cost capacity, dominated by gas engines, batteries and DSR. Steepening: supply stacks are pivoting steeper as a result of removing coal/CCGTs (middle of the stack) and replacing with low variable cost renewables (bottom of the stack) & high variable cost peaking flex (top of the stack). Shifting: growth in intermittency is causing growing fluctuations in supply stacks (shifting left and right) as wind & sun conditions constantly change. Both these factors support a structural increase in intraday price shape and in price volatility. Steepening causes a greater price impact for a given change in demand. Shifting causes greater fluctuations in the marginal capacity units setting price. Rising price shape and volatility increases the flexibility value or optionality of power plants. In this article we consider how power plant optionality behaves in relation to variable dispatch costs across different capacity types (renewables, conventional thermal and peaking capacity). The optionality of power plants is derived from their flexibility to ramp output up and down. They are essentially granular strips of call options on the spread between market power prices and plant variable costs. We illustrate this relationship in Chart 1 which illustrates the variable cost dispatch hurdles (effectively the varying option strikes) for different capacity types. Source: Timera Energy. Note battery dispatch hurdle is more complex than for thermal assets as described below. 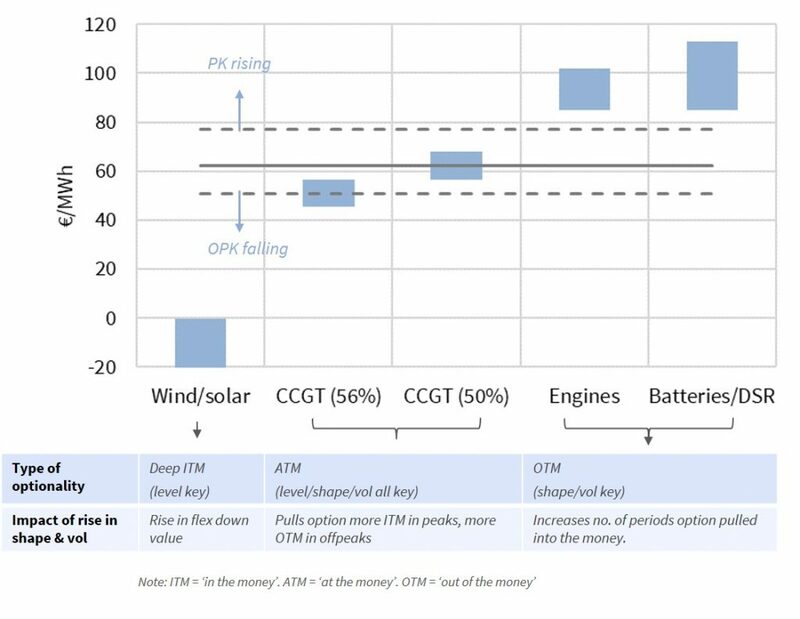 The optionality of renewable capacity (such as wind and solar) is deep ‘in the money’ (ITM) given near zero (or even negative) variable dispatch costs. In wholesale market terms, the deep ITM nature of renewables means their value is focused on the level of power prices, with a low value attributed to flexibility to respond to price shape and volatility. The ‘price cannibalisation’ problem is particularly important for wind and solar capacity. There is a strong correlation of high renewable output with weaker prices e.g. when the wind blows the price received by wind capacity falls. Renewable flexibility is being used to provide balancing services in some markets, typically from ramping down when networks can’t cope with high wind load. But revenues form a relatively small portion of overall margin. The variable dispatch cost hurdles of CCGTs and coal units vary with plant efficiency and location. But the optionality of these assets is typically closer to ‘at the money’ (ATM). In other words, variable dispatch costs are close to the level of market power prices. This is reflected in the relatively tight nature of clean spark and dark spreads relative to power prices, particularly with rising renewable output pulling down power prices and thermal load factors. Flexible ramping to capture price shape is becoming increasingly important for these units, as renewable output pulls down average price, spark/dark spread levels and load factors. A similar logic applies for capture of price volatility e.g. caused by short term fluctuations in wind speed, solar patterns and demand. In option terms, the extrinsic value of conventional thermal assets is rising as average prices and load factors decline. This group consists of a number of different capacity types across gas engines (of various efficiencies), GTs, batteries and demand side response (DSR). On a variable cost basis these units are typically ‘out of the money’ (OTM) versus hedgeable market prices. In other words unit variable dispatch costs are above even peak prices, as illustrated in Chart 1. Batteries are a unique and more complex case that we have set out in more detail in a recent article. Battery dispatch is based on relative not absolute price signals (e.g. the time spread between individual hours). The dispatch cost hurdle depends on degradation costs & assumed offpeak charging levels. Dispatch may also reflect ‘shadow pricing’ of battery discharge against other peaking asset variable costs. The characteristic that all different types of peaking flex have in common is their exposure to spot price volatility. The OTM nature of optionality means that value is realised by ramping to capture price jumps (and price dips in the case of batteries). The portion of power plant value generated by ramping flexibility is rising, as renewable penetration pulls down average prices. The importance of plant optionality is set to continue to rise as stack steepening and shifting dynamics support price shape and volatility. Investors and owners are confronting a key challenge in being able to quantify and capture the value of optionality of different types of capacity. The starting point is to properly deconstruct asset optionality and analyse the interaction between variable dispatch cost hurdles and market prices.